It would usually take place about seven to ten working days after making the funeral arrangements. 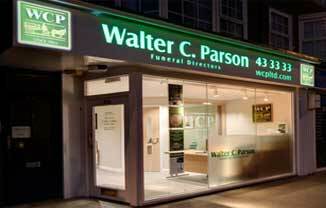 Remember that the funeral has to be arranged with the minister or celebrant, Church and the Cemetery or Crematorium. We will sit down with you and give you all the necessary options. We will tell you the earliest possible date that the funeral can take place. The choice is yours whether the earliest date is convenient or you would prefer to delay it for the family’s convenience. You may wish to avoid birthdays, anniversaries, holidays, examinations or other family occasions. You may have recently talked to the person who has died about special requests. There may be specific requests in their Will which is probably held by a solicitor or bank. Perhaps a pre-paid funeral plan has been purchased in which case you'll know some of their wishes. Sometimes you may have to make the decision yourself. A burial is often more expensive than a cremation. If a burial is chosen: Which Cemetery or Churchyard is preferred? Will it be a new grave? These are usually opened to allow space for two people, sometimes three. Is there an existing family grave to be re-opened? We will need details of the last interment so that we can locate the grave. A cremation is often less expensive than a burial. If a cremation is chosen: Which crematorium is preferred? There are two in Plymouth, Efford and Weston Mill, also locally available are Bodmin, Torquay, Exeter, East Devon and Truro. Different cemeteries have different regulations on which we will be pleased to advise. What other acts of remembrance can I do after a cremation? There are many options usually provided by the crematorium, including Books of Remembrance, rose bushes and commemorative plaques. What will I do with the cremated remains (ashes) afterwards? There are two traditional alternatives: They can either be scattered or buried. It is then a question of where. We offer a wide range of keepsakes for cremated remains, which can be found by selecting the Useful Links section of our website. These include urns, smaller keepsakes and jewellery, all of which allow a small portion of the cremated remains to be placed inside. Cremated remains can also be placed into jewellery (Ashes into Glass), a firework, a tattoo or even sent into space. We would be pleased to discuss alternative options with you. If they are buried, it may be in an existing family grave where there is no room for a further burial. Or in your local churchyard which may be closed for full burials. You may decide to purchase a new cremated remains plot at the crematorium and have a memorial tablet with an inscription so that you have somewhere to visit afterwards. They could be buried at sea, which we can arrange, or by the Royal Navy if there are Naval connections. Or you may decide to take them and bury them in your own garden. If they are scattered, it may be on an existing family grave in a cemetery. In the garden of remembrance at the crematorium. Scattered at sea, by yourself or with the help of a friend who has a boat. Or scattered in a favourite place, perhaps your own garden with a seat or favourite plant sited for remembrance. If any of the above is confusing or not appropriate please do not rush into a wrong decision. We will always be pleased to hold the cremated remains at our premises to allow you the time to think about and settle on the right decision. We have a wide variety of suitable containers available for you to choose from.